I found out that we as a people (meaning Democratic party operatives) have finally broken through the glass ceiling with the nomination of Hillary Clinton to be their party’s candidate for president in 2016. And, we all know that America is woefully tardy when it comes to electing women candidates in primaries for presidential elections. Enlightened nations got the decades jump on the good ‘ol USA on this score – Golda Meir was the Prime Minister of Israel in the 1970’s, Margaret Thatcher was the Prime Minister of the UK in the 1980s and Angela Merkle is the President of Germany right now. And it’s clear that we have recognized these nations’ demonstrations of enlightenment. Who can forget GWBush’s friendly (and certainly not creepy and misogynistic in the least) shoulder fondling of the German leader in 2006? But, hey, you know, the USofA has done its part recognizing the unique capacities that women bring to leadership and we can be proud to have broken the glass ceiling of appointments when we rose as a society collectively and appointed Madeline Albright, Condoleeza Rice and Hillary Clinton to the position of Secretary of State. We can be certain that the women and children of many countries will give the United States complete and full credit for each of these glass ceiling breaking appointments, the women and children of Iraq for instance. I know that to ascribe personality traits specifically by gender is problematic and reductionist, but it was the Democratic Party who chose this theme as one of their candidate’s advertising slogans. Hillary, fighter for women and children, she ‘feels the pain’ of workers, the disenfranchised, the weak and marginalized, we are sold, I mean, told. Shattering political candidate ceilings we are promised will also usher in a new era of thinking and responding and acting, maybe not in repudiation of the masculine drivers of the republic, but at least we are promised a version augmented and lifted by the feminine. But, what was also shattered at the Democratic National Convention was the actual historical record of politician, corporatist, militarist, classist, Zionist Hillary Clinton, a carpet bagging political opportunist who willingly does the bidding of oligarchs as she personally makes fun of the little people public servants are supposed to serve. Shattered like the cities and towns of innocents in Serbia, Iraq, Afghanistan, Honduras, Syria, Lybia and other places Hillary’s self described ‘American Exceptionalism’ has wrought exceptional destruction and havoc. Shattered like the homes of American citizens whose country once gave basic assistance to all – until the Clintons together “ended welfare as we know it”. Shattered like the families separated by the private prison industrial complex that was constructed on the racist edifice of Bill Clinton’s Crime Bill to cage human beings that Hillary referred to as “super predators”. A horrific and incriminating real life personal history splintered, atomized, crushed by lies of Orwellian proportion into a noxious silt and swept under the rug of collective consciousness at the Wells Fargo Center in Philadelphia. It is a healthy mental exersize to swap out masculine descriptors of God, found so often in our Torahanically/Biblically/Koranically infused culture. A jealous and wrathful God quickly morphs into a gentle and compassionate god. In western geo-politics we see, however, that the women we choose to lead are as sharp elbowed, selfishly calculating and horribly destructive as any man we have given these jobs to since civil society began burning, looting and otherwise “spreading civilization” across this blue rock. It is within this history – the history of appointing and electing the most inhumane defenders of oligarchy, that happen to also be women, to positions of power in our great land – that I reference the appointment by Franklin Delano Roosevelt of Frances Townsend to the cabinet position of Secretary of Labor in 1933, to edify and hopefully shame Hillary Clinton and the chorus of her historically challenged supporters who laud the promotion of this blood thirsty servant of the American empire to the position of “major party candidate” for US president. Ms. Perkins during her term as Labor Secretary envisioned and instituted the Civilian Conservation Corps, the Public Works Administration, the Federal Works Agency, and the labor portion of the National Industrial Recovery Act. She wrote and shepherded into existence the Social Security Act that established unemployment benefits, pensions for elderly Americans, and welfare for the poorest Americans for the first time in our history (programs that neo-liberal Democrats like Bill Clinton, Barack Obama and Hillary Clinton have been trying to destroy for the past 30 years). She worked to reduce workplace accidents through government regulation and helped create our nation’s first laws against child labor. She established the first minimum wage and overtime laws for American workers, and defined the standard forty-hour work week through the Fair Labor Standards Act. She formed government policy for working with labor unions and helped usher the first wave of American women into the workforce, into jobs that had been up to that time exclusively male occupations. Ms. Perkins is a true American hero who happens to also be a women. 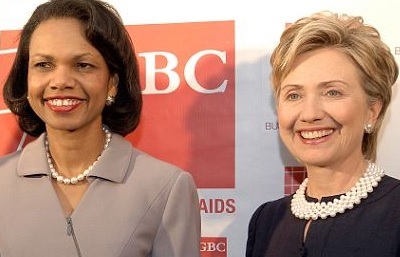 Hillary, Madeleine, Condoleeza are fakers, pretenders, and defenders and help-mates of rich war-making men. America was sold a soda-pop commercial of feminine fakery this week. Hillary and her legion of duplicitous defenders say that she is a “strong woman who gets things done”. A “feminist minded” public servant whose dastardly to-do list has included so far, pimping for oligarchy, destroying the planet, droning and cruise missiling poor people and the impoverishment and mass incarceration of America’s minority citizens. I can’t wait to see what additional firsts Ms. Clinton will introduce us all to when she becomes president. Maybe we don’t need a fake feminine “humanitarian war” mongering protector of wealth to elevate American society and shatter glass ceilings. Maybe we just need a human, a humanist, a public servant who knows what has to be done to serve our citizens and help our land – and we all know what needs to be done. We don’t need to make fake history – we need Frances Perkins.